Major Mildred Alice Stewart is the daughter of Alice Beattie and Charles Stewart of Thamesford. 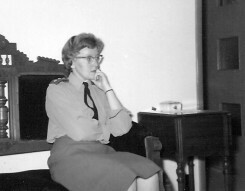 She graduated as a Registered Nurse from St. Josephs Hospital in 1947 and served in Germany after the war as well as Churchill, Manitoba and Toronto. She later married Dr. Chris West.